We are proud of our region, and we know if you come here, you will appreciate our wines, but also our landscape, as you walk through the vineyards! 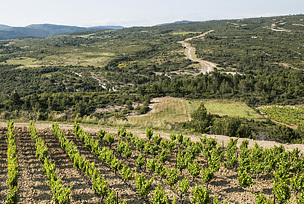 We have created 2 treks among the vineyards, to discover the vines and the “garrigue” all around. http://www.minervois-tourisme.fr/trace_Les-fours-a-chaux.html , or see an old millstone quarry, at the top of the mountain near us.